All of us want massive traffic to our blog. When it comes to driving the same, most of us fail. Do you know why it happens? There are tons of guides on traffic generation available. The problem really is you try to focus on all of them. Let me tell you one thing. If you keep on concentrating on a few methods to drive traffic, it will eventually work out for you. Do you utilize social media websites? If you do, you must focus on a few of them. Every popular blog has two main kinds of traffic Organic and Social Media traffic. Organic traffic is always better to have but it takes a lot of time and works to attract, while social media drive traffic that comes in instantly if your social media promotion is done effectively. In this article, I am going to help you drive a decent number of visitors from StumbleUpon, which of course, is a social media site to share web pages. Why Use Stumbleupon For Your Blog? As I already told you social media can drive insane traffic to your blog if the promotion is done perfectly. Stumbleupon is been counted as one of the best social media sites for bloggers for content marketing and luring new visitors. Why do Bloggers like to Get Stumbled a lot? In Stumbleupon when your content get stumbled by any user it will be visible to other users with the same interest in Stumbleupon. Which makes it, even more, chances to get more stumbled. The best part about Stumbleupon traffic is that it lands visitors directly on your site page. And this makes it very helpful to drive massive traffic to your blog. I hope you know what StumbleUpon is. So, I am not going into the introductory part. I just explain the process of stumbling and then, you will read some thumb rules to make the maximum out of it. The very first step is signing up for the service itself. If you haven’t signed up for StumbleUpon, do it right now. As for any social media network, you have to fill a few forms. Once you are done with it, you can start stumbling web pages using the Add a page button on your profile or StumbleUpon button on websites. While adding a page it asks for required details about the page you want to add, i.e: page URL, page interest and tags for the page. For more details check out above shared screenshot. 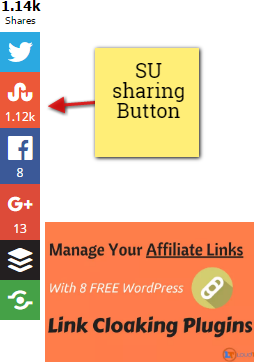 # You can use social media sharing plugins to add a page to StumbleUpon. # You can also use StumbleUpon browsers extensions to share your content more quickly on StumbleUpon. By adding StumbleUpon toolbar into your browser, you only have to visit a site page and like it using like button given in toolbar. # One more easy way to share your content on StumbleUpon, go to your profile and “Add a Page“. You will find this option on the very top right of your profile. You can also like web pages people already stumbled. In order to make your SU profile engaging, you have to like and stumble others’ content. Also, follow some like-minded users for better interaction. When you share a web page, you will have to fill a form with some basic information about it. There are browser extensions and mobile applications available. You can use them in your leisure time to create engagements on your profile. That’s all about stumbling web pages. And, you need to bear some rules in mind. You should share the content of others more often than you share yours. And, you must recommend already shared posts as well. Make sure you stumble the post soon after you hit the publish button in your admin panel of your blog. When you share a web page, it will ask you to select categories. The selection here determines the type of your audience. So, you must be extra vigilant while choosing categories. You can join bloggers’ groups (you can find many on FB) including people, who reciprocate shares to increase stumbling count. Create compelling featured images to increase CTR. You can send a shout out to your followers to increase the stumbling count. I hope you know how to drive massive traffic from StumbleUpon now. If you have any doubts, you can comment down below. I will reach out to you with a solution at the earliest. Don’t forget to share this article with your friends and followers on social media. Happy blogging, happy earning. StumbleUpon is certainly one of the best places to gain traffic.although I have found out that 50% of traffic form StumbleUpon is not converting, but still I got some good customers, I will consider it a very good place to gain readers & customers. So regarding that, your post is very informative. Keep up the good work. Thanks for your feedback. Traffic coming from StumbleUpon is always a mystery as their traffic system works little different from other social media. There are no referral links but still, a good quality article get a chance to drive huge traffic to your blog. Thx so much for this.